Last night I sat down in my craft room with only one objective: to make a page for this year's One Little Word. I've definitely had my word - shifty - in mind recently and I'd like to start documenting how it's starting to define me and my choices this year. But first, a title page. 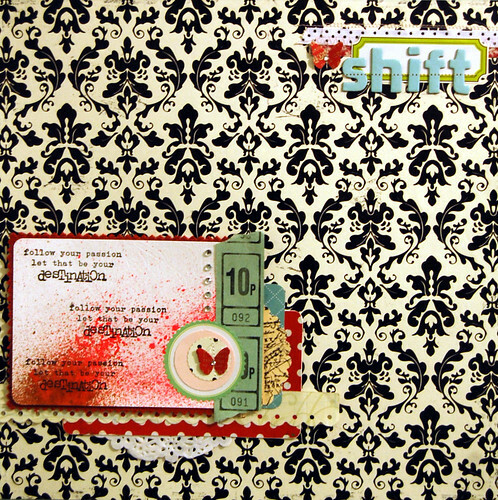 So with this month's The Counterfeit Kit on standby, plus a few of my gorgeous stamps from Make The Day Special, I got a 'shift on'. I would never have used this Making Memories patterned paper as a background (or possibly, ever) without the encouragement from the Counterfeit Kit Club. It seemed just too damn special. So, in order to make myself feel a little bit better about using it, I pulled the rest of the papers from my scrap stash. The main focal paper was a practice sheet which I'd tested out my shimmer mists and stamps on and I've only added a couple of pieces straight from the packet - some American Crafts Remarks, Thickers and a little bit of bling. Here's to shifting some of my stash! Love it! nice take on the challenge. That paper is fantastic! You clustered your journaling/embellishments nicely so it still shines. I really like your take on this challenge. All of the layers are great! Beautiful! I like the tickets and the little butterfly. Looks you are off to a great start. Love the paper and the way you did the embellishments! Oooh nice paper! And quite right to use a special piece for a special title page. I love the clusters and I like the idea of the title hanging over the label, I would always try and fit something in the gap but I might have to pinch this idea! Very pretty! I love what you did with this! 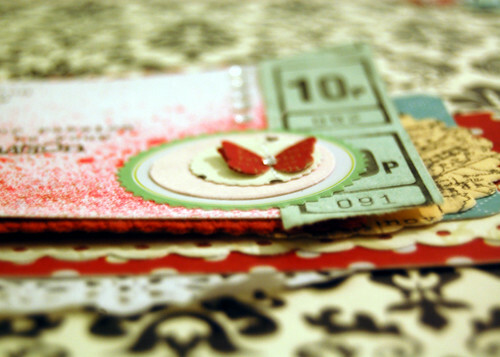 I think your layout is very pretty...I love the little cluster of embellishments and ephemera. I'm glad you were able to "just use" your special paper!